"Life is a constant battle for survival. As we grow older, the rules change on daily basis. our mission is not to escape, but to survive; not to deal with triumph, but to deal with failure;not to run away from fear, but to master it." its been a while since my last post. been a busy month for me this past month, a lot of activities that keeps me away from the pc for a long time. its the month of june and back to school again (for students and teachers). actually for me, its back to everything. being bantay sa shop, back to hatid sundo sa school and back from vacation. yes, kahit na hampas lupa itong inyong lingkod, i can still afford pa naman to have a decent vacation together with the whole family. i am happy to say that this is the vacation that the whole family really enjoyed (pwera lang siguro ako, lalo na pag na iimagine ko ang damage it will do to my pocket!). this time we really planned several months earlier. we left Antique May 22 for Manila. Our itinerary will be May 25-29 Manila and May 29-June 2 Cebu. The company includes me, my wife, the two kids FP and ZY, Joy-joy ( our all-around assistant/scholar and Pebbles, my wife's 7-year old niece who is on a reward-vacation (she was allowed to go with us as a reward for passing the entrance exam of Antique SPED Center's Grade 1-FL (Fast Learner). It also happened that our FP nearly topped (no. 2) in the Qualifying Exam of the same school in Preparatory-FL. So its another reason for us to pursue the planned vacation plus we have to fulfill our panaad (a thanksgiving celebration and a fulfillment of a promise and vow)to Sto. Niño de Cebu for the safe and normal delivery of our second son ZY. Though nabutas nang husto ang bulsa, i think its worth naman since doon ko lang nakitang Dondon really enjoyed his vacation (everytime kasi na magbabakasyon kami ay laging nagkakasakit kaya hindi gaanong makapag enjoy sa mga gala) lalong lalo na sa Manila Ocean Park and Snow Town in Star City plus other places we visited including Flying Kite at Luneta and even on the Mall's Playground! Here are some of the pics from our vacation. 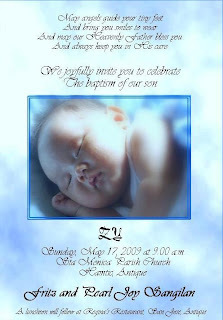 May 17, 2009 marked another important day in our son's young life. For this day, he received the Holy Sacrament of Baptism. HOT Comments Graphics Happy Mothers Day Images Need NEW Comment Codes? Miss na kita Nay, I love you! P.S. Kumusta mo na lang ako kay San Pedro. I would also like to greet the equally Great Mom in the World, my lovely wife a Wonderful Mother's Day! Thank you for giving me two adorable kids. I Love you MOM! I want to share this OKM video by Noel Alamis. Actually this is one of the first (and undeniably a hit)OKM (Original Kinaray-a Music) and had gained its popularity with its upbeat and danceable tune. It has been aired not just in Antique but also heard in the airwaves and a much requested song in every baylehan of Panay, parts of Negros and even in Mindanao with Karay-a speaking population. Today is our Town Fiesta... the Feast of Sta Monica. Whats interesting about it?.. nothing! Aside from the poor preparations by our municipality, its been raining like hell for several days already. Thanks to Typhoon Dante. The yearly Hantikan Festival seemed to look like a festival for frogs. The Banig Band's performance of OKM (Original Kinaray-a Music) on the night of Festival's kick off was witnessed by less than a hundred or so (mostly teenagers who didnt bother the sky urinating at them and the flooded town plaza). They were good... thinking that the vocalists are two of the province's known OKM artists and my favorite (Sammy Rubido and Mark Quintela), it should be witnessed and appreciated by more. Thanks to the rain (again) and most people prefer to lay their Banig (sleeping mat) and snore the rainy night off. The vespera night is also celebrated with a band with matching tables for drinking fronting the stage. Bagay na bagay ang setting since the vocalists' voice are just like singing in the karaoke bar. This time the rain stopped for a while. The sky poured all the rain early in the morning. I was happy for it since we will not be preparing any food nor accepting any visitors. We agreed that this year we will be practical. Instead of spending a lot for feeding mostly people we don't know and leave us with mountain of dishes to wash afterwards, we would just save it for other activities where the whole family will benefit and enjoy. you might call us stingy but i will call it being paractical. heheh. with the world in crisis, we cant afford to be extravagant! So the rain continue and i am smiling. With this rain, nobody would dare to visit us at the end of Poblacion (Outside the civilization) and brave the moon-like craters of water and mud just to have free lunch. But alas! Sta Monica seemed to hear all the prayers cause at 11 am the skies cleared and people started to emerge on street like ants after the storm. Then there's a knock at our door. Its my sister and her 3 kids! she was informed earlier that we are not preparing anything but she insisted. She just wanted to get out of their house away from her mother-in-law for a while (i don't know why there's always an issue when it comes to mother-in-laws?). So my mother-in-law(whom i love) was forced to rummage our freezer and cook menudo for our insisting guest and she manage to have it served at exactly 12 noon! that was quick! and delicious! We are busy at the dining table when another knock at the door brought us to a pause. There's a heavy-built 40 something man and a kid with plastic bags of rice and fried fih outside with a letter saying that the kids father was killed by the rebels (i don't know which rebel) and needs some help. I gave them 20 pesos, the only amount left in my wallet. They then asked if we can give them food. So i asked our help to put menudo on a plastic bag and hand it to the visitors. While our helper hands the menudo, the man suddenly asked "Baboy ba ito, Muslim kami... hindi kami kumakain ng baboy". Watdahek! nanghihingi na nga, namimili pa! sorry na lang sila since that's the only food we prepared. So the guys went away with only 20 pesos from my dying wallet. Ten minutes later, we heard another knock and it was these two ladies(Aborigine Aetas) who happened to be the helpers of my wife before when they were still kids and living with their grandparents. They frequent us every fiesta and new year asking for aginaldo and old clothes. I can still remember the last new year that they almost fight over a carton of used clothes, shoes and toys that we prepared for them. We were lucky that its just the two of them today cause in the past they used to be almost a barrio. They just asked for a take-home food since they had already eaten at our cousin's house. So we handed the plastic bag which the Muslim visitor recently rejected and the other lady managed to empty the bowl of menudo that was left at the table and filled her plastic bag. They then asked for jeepney fare for their way home. Life nga naman! i am just thankful i am not in their position to beg for jeepney fare. So, its my wife's purse turn to be drained this time. Sa awa ng Maykapal, no more visitors disturbed us after that since we ignore text messages of friends who asks if there's extra food left for them. What a way to spend town fiesta without spending too much! Wag lang sana kaming gabaan ni Sta. Monica for ignoring her Feast. This is a video of the Banig Band performing in another town's fiesta. Its the first time i watch Pacquiao's fight live via pay per view. 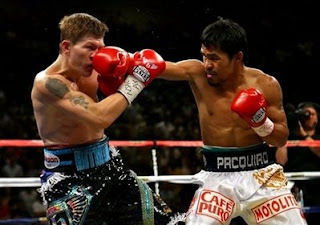 I am not really a big fan of Manny Pacquiao but i cant help myself from cheering especially when Manny Pacquiao TKOs Ricky Hatton on the second round of their fight. 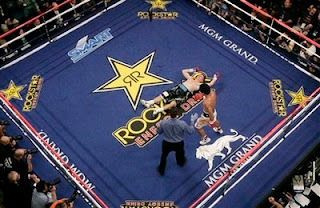 Pacquiao knocked down Hatton twice in the first round then hit Hatton with a left in the second that sent Hatton flat on his back on the canvass of the MGM Grand Arena. 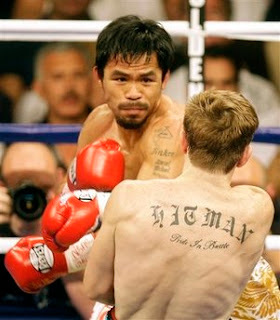 Pacquiao snatched Hatton’s International Boxing Organization junior welterweight title and his sixth title in different weight divisions. Congratulations Manny! and to all Filipinos around the world cheering for the People's Champ.... Mabuhay! Medyo sayang nga lang ang mga bumili ng ticket sa mga cinemas. Hindi man lang uminit ang mga puwet, Knock out na kaagad. To those who have not watched the fight, click this. They say that dog is man's best friend and i can say yes to that. They are the most effective guards especially at night. However, sometimes instead of being helpful, nakakairita din ang ingay nila pag gabi. We have 2 dogs at home. We call them Marky (Red) and Pula (White). They were with us for almost four years and they can be trusted when it comes to taking charge of home security at night and even at daytime. Since the birth of our second child Bos, i felt the obligation to attend to his night time necessities such as changing diapers, bottle feeding, and even singing him to sleep (and its where i really excel! really!). Those who had experienced having to nurse a newborn at night knows that you will really need cups and cups and cups of coffee to be awake. So, after i close my shop (around 10-11 pm) i then report to my next duty.Minsan pag hindi na makayanan ang antok, nakakakatulog na lang ako habang pinapadede ang bata. So imbes na makatulog ng mahimbing, magigising ako bigla sa iyak ng bata dahil nag lungad na dahil hindi ko pala napa burp! Nakaka adjust na sana ako sa ganung routine but lately, nabubuwisit ako dahil maya't maya ang ingay ng mga aso.Nag aaway pa dun mismo sa tapat ng kuwarto namin. Ang kuwarto namin is on the back portion of the house. Aba! anong ginagawa nila sa gabi at dun sila nagbabantay sa likod-bahay na dapat ay dun sila sa gate or sa harap nng main na pinto or dili kaya ay rumuronda! (Naranasan po ng inyong lingkod na mag guwardiya noong madatung nagbabarko pa ito kaya alam nito ang dapat at hindi dapat kapag nagbabantay!) maya't maya ang away nila at sa wari ko ay may ibang aso silang kaaway. Everytime na magrarambol sila, ganun din ang iyak ng bata dahil nagitla at naabala sa pagkahimbing. Kinaumagahan, habang may muta pa papungas pungas ay hinanap ko ang dalawa para mabigyan ng leksiyon sa panggugulo nung gabi. Tamang tama naman paglabas ko ay may kaaway na naman sila. Actually itong si Marky lang ang nang aaway ng mga lalaking aso na pumapasok sa bakuran namin habang si Pula ay nasa sulok at waring nanonood lang. Nung araw na yun, panay ang pakikipag away ni Marky at napansin ko na lahat ng aso na pumapasok ay puro lalaki at puro aso sa neighborhood. Syempre matapang si Marky tulad ng amo (misis ko) winner siya palagi. Kung hindi duguan ay papilay pilay na tumatakbo palayo ang mga intruders. It seems that meron siyang pinuprotektahan at ala-Knight in the Shining Armor and role niya. Napansin ko din sa Marky na to, laging nakabuntot kay Pula kung saan man ito pumunta. This curious mind of mine started to took notice of this peculiar behavior and i started observing (hima sa umaga and the Bos is sleeping kaya i have the luxury of time). Maya maya pa nakita ko sa likod ng bahay itong si Marky ay akmang papatong sa likod ni Pula and started to make his way behind Pula. Itong Pula naman ay parang pabaya lang na parang sinasabi na "O ayan na ang reward mo sa pagiging macho gwapito na bodyguard ko. Go on.. reap the fruits of you labor.." Kaso napansin nila akong namboboso nakatingin kaya hindi natuloy ang action. Nahiya siguro o baka hindi lang makapag concentrate kung may nanonood. Biglang may bumbilyang nagbukas sa ulo ko. (Kung mahina pik-ap nyo, ibig sabihin nun i was enlightened!). Ito palang si Pula ay in heat. And according sa Animal Science class ko nung nagbubulakbol nag-aaral pa ako sa YUPI ELBI, kapag in heat ang isang hayop, mayroon silang hormones (sort of) na kinakalat sa hangin sending a message na "I am in heat... you are invited to join me in a party!" parang ganun... so ito namang mga male eh tulo laway pagkaamoy ng invitation kaya sugod agad. "Yes! libre kain na naman to!" Eh ito namang Marky, dahil nga partner niya si Pula, ang lahat ng lalaking aso na lumapit ay inaaway. Siyempre kahit sino ba namang lalaki, pag partner na niya ang kinatalo... aba patayan na! Iningat ingatan mo ng matagal tapos ang iba pa ang makikinabang! Naalala ko nung nakaraan na mag in-heat itong si Pula ay kawawa ang sinapit sa kamay ng kung sino sinong barakong aso na lumapit sa bahay. Dahil ang lahat ng pumupunta ay nakakatikim ng libre at take note... pinipilahan siya. Pagkatapos ng isa ay may mga nakaabang na waring nag aaway kung sino ang susunod. Ang kawawang Pula ay walang magawa kundi pagbigyan ang kahayukan ng mga tampalasan! At that time itong si Marky ay hindi pa na eestablished ang pagiging dominant male sa neighborhood at walang magawa para ma i rescue ang kanyang damsel in distress. Ang kahayupang iyon ay nagbunga ng apat na cutecute na mga tuta at hindi ko na maalala kung sino sino ang mga pinagbigyan namin nun. Kaya pala siguro this time ay ganun na lang ang pagtatanggol niya sa partner. Imbes na paghahambalusin ko naghanap na lang ako ng kaning lamig sa kusina at pinakain ng almusal para naman magkaroon pa ng extrang lakas para mas maipagtanggol niya ang kanyang beloved Pula and at the same time ay makapagbantay ng maayos sa bahay. Doon ko napagtanto na hayop mang ituring ang aso, may mga behavior din na katulad ng isang tao. At meron din naman na tao kung tinuringan pero masahol pa sa aso ang pag-uugali. Do you have an appetite for exotic foods? or are you adventurous enough to try one? I have prepared something for you. Hah! ala WOK WITH YAN naman ngayon ang drama ng inyong lingkod! Since its been raining here for almost a week now, hindi ako makatulog sa gabi dahil sa ingay ng mga creatures na to. Kaya to make my revenge, i will be preparing something special using them para naman maging kapaki-pakinabang sila aside from being scandalous at night. 1. Make sure to wash the Kokak Meat thoroughly with warm water. Add salt and mix. 2. In medium heat, saute onions, tomato and garlic. 5. Simmer till the sauce is almost dry. Add black pepper. Bangag sa Abril, Where Art Thou? Rain had been pouring straight on its third day now. To think that its the month of April, what happened to the local term "Bangag sa Abril" and it seems to nowhere to be found? Maybe this is what they call Global Warming. Abnormal as it may seem,yet some are happy for its occurrence this summer; Our newborn son that is saved from the scorching summer heat inside a ceiling less room, and Joy that is saved from her daily obligations of watering the garden. Been busy lately with house-and-work routines that i cant think of something to write so i just grabbed a post from someone. This really made me laugh! 5000 candidates assembled in a large room. One candidate was MARIO DIMAYUGA. Bill Gates: "Thank you for coming. We'll do this by process of elimination to speed up the process. Those who do not know JAVA may leave." 2,000 people left the room. MARIO said to himself, "Naku! I do not know JAVA but I have nothing to lose if I stay. I'll give it a try." Bill Gates: "Candidates with no experience managing more than 1000 employees may leave." Mario said to himself, "Lagot! I never managed anybody but myself but I'm staying. What could happen to me?" Bill Gates: "Candidates without management diplomas may leave." Mario said to himself, "Asus! I never even graduated, but what have I got to lose?" Lastly, Bill Gates asked candidates who did not speak Serbo-Croat to leave. Mario says to himself, "Patay! Ano yon??? But I've gotten this far, I have to stay on." So he stayed and found himself standing with only one other candidate in the room. Everyone else had eliminated themselves. Bill Gates joined both candidates and said: "Apparently you two are the only candidates with terrific management skills speaking Serbo-Croat, so I'd now like to hear you converse in that language." Calmly, Mario turned to the other candidate and said, "Kumusta ka, pare ko"
Without batting an eyelash, the other candidate replied, "Mabuti naman. Ikaw? BLOG! BLOG! BLOG! and more BLOGS! How to make Vegetarian Food? - The word Vegetarian means the people who refrain from the consumption of red meat, poultry, and also the flesh of … Read More "How to make Vegetarian Food?"